Adventure Pilgrims Trekking has experience climbing guides who will take you to summit the top of the worlds but for the beginner of the climbing with technical support with our staff you will be in top of the Ramdungo Peak Climbing . 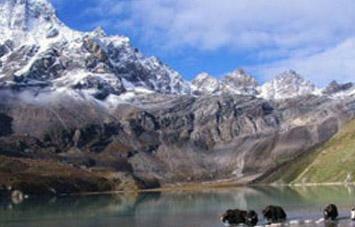 It is in the wilderness area of Nepal and where is many snow lakes/ice lakes lies there really remote area of Nepal. After 5 hours driving from Kathmandu to the Dolkha on the highway to Tibet you will leave the civilization behind and head towards in the tranquility of the mountains in the hidden land of Rolwaling Valley. The trek passes through spectacular high alpine valley, beautiful alpine forest of pines and rhododendron with picturesque alpine passes including traditional and unspoiled rural villages. 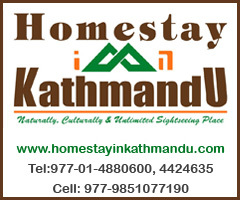 Similarly you can have chances to views of farm fields, alpine pastures and the highland villages of Sherpa, with the backdrop of the towering view of Mt. Gaurishankar straddling the border with Tibet. The trek leads to the last village of this area Rolwaling at Beding. 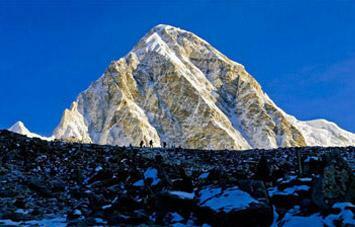 Adventurous journey continues further east to scale the 5,925m Ramdung Peak. The climb is not technically hard, but it is certainly challenging on account of the altitude and the peak remoteness. Ramdung in the Rolwaling Himal is most of the time used as a warm-up peak for the 6000-meters in Rolwaling. The normal-route is climbed via the North Glacier and North Ridge. The ascent of this peak requires no more than simple snow walking. The route is not steep but quite long though. Ramdung offers an excellent view of Everest, Melungtse, Gaurishankar and numerous other peaks. After the climb, one more adventure awaits you to cross the 5,755m. Tashi Laptsa pass. The crossing takes at least 2 days. After crossing the pass, a long descent to Thame Valley, then coming to the village of Thame in the Khumbu area of the Everest Region. From here, the trek comes to the main trail to Namche Bazaar, the Sherpas Capital. From Namche, a scenic day walk to Lukla for the last camp and for the panoramic flight backs to the busy and bustling city of Kathmandu. 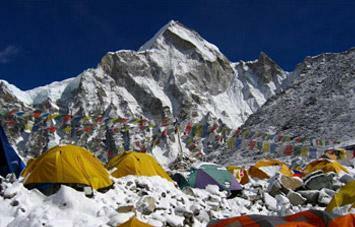 Permit fee of Ramdung Go Peak 5925m.